A still from the #MoveForEquality video. Top grandmasters Magnus Carlsen of Norway and Anish Giri of the Netherlands today joined forces in a video posted on Carlsen's Twitter account as part of a United Nations campaign against racism. For once, they broke the rule in chess that White begins. It all started on Tuesday evening with a slightly mysterious tweet and Facebook post from Carlsen. The world's number-one chess player appears together with world number-four Giri, in front of a dark background that some insiders might have recognized as The Good Knight chess pub in Oslo, where the video was recorded on Tuesday. Carlsen: "We broke a rule in chess today." Giri: "To change minds tomorrow." The 17-second video functioned as a trailer for the real thing, posted 15 hours later. Again we see the two top grandmasters, now in a video that runs 1:17. In the video, Giri says: "I've been playing chess since I was six years old and every time I've played, White started." Carlsen: "This rule was never about race or politics but we can break it to send a message to everyone who believes that color should grant advantage in chess or in life." Then it becomes clear what the video is about: It mentions that Thursday is the United Nations' International Day for the Elimination of Racial Discrimination. Carlsen sits down at a chessboard, shake hands, the hashtag #MoveForEquality is shown, and the game starts. As Black, Carlsen plays 1...d5. 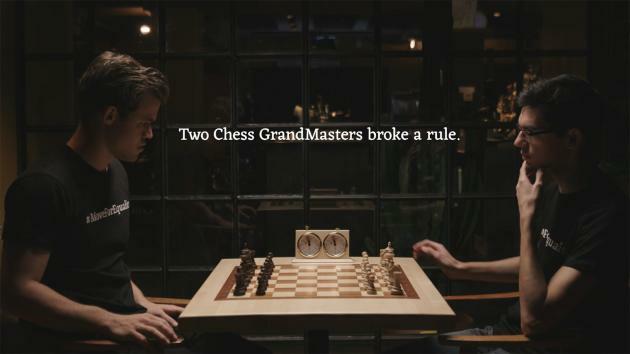 "For the first time, two chess grandmasters broke a rule. And Black started." Giri: "It is difficult to change your mindset in a chess game with a different start. But if we can change our minds in the game, we can surely help people change their minds in real life." What follows is Trompowsky with colors reversed, but then the video ends. The video, also posted on Carlsen's Facebook page, is part of a bigger campaign by the United Nations in its fight against racism. Its international day against racism was put on March 21 because it was on that day in 1960 that a peaceful demonstration in South Africa against the apartheid was brutally ended, with the police opening fire and killing 69 people. "[T]his campaign is merely a symbolic gesture to highlight what happens when you step away from the board, where a fair world is not a reality for many, and the dream of having perfect equality between races and people is still far from coming true." The rule that White plays the first move only existed since the late 1800s. For example, in their famous matches in the first half of the 19th century, the British player Alexander McDonnell preferred to play with the black pieces against the French player Louis de La Bourdonnais, also in the games where he had the first move. A famous example of a game that was actually played "in reverse" was the Immortal Game (Anderssen-Kieseritzky, London 1851). Anderssen moved first, but played with the black pieces. It was later recorded from the white side. Whereas Carlsen and Giri are rivals at the chessboard and on Twitter, where they have fought quite a few verbal battles, it is great to see them joining forces for a good cause. They'll soon meet again for a classical game, at the Gashimov Memorial, March 31-April 10 in Shamkir, Azerbaijan. For more upcoming top chess events see your up-to-date chess calendar!